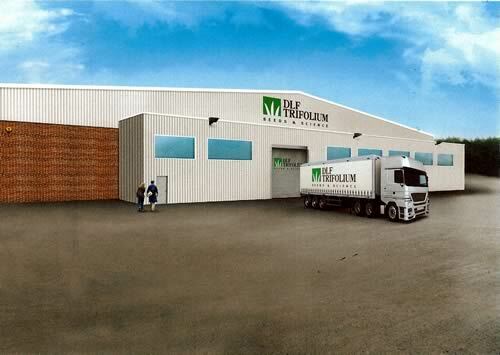 DLF-Trifolium is spending £3 million on a new 4,000m2 (43,000ft2) grass seed mixing facility and distribution centre just outside Edinburgh. It will be the biggest investment in grass mixtures production ever seen in the UK, with the capacity to handle up to half of all the agricultural grass seed sown in the country. Most of the seed passing through the plant will have been grown on farms in the UK and mainland Europe, with the rest coming from as far as Canada and New Zealand. The site, which has excellent road links north and south, is to be fitted out with 48 raw material bins to hold individual varieties. Bespoke automated equipment will select, mix, pack, treat, label and palletise the seed according to customers’ specific requirements. The planned start date for production is October 2014. The plant will have the flexibility and capacity to produce more than 3,000 different grass seeds mixtures, and will be capable of running 24/7 during periods of peak demand in spring and autumn. Individual orders will be weighed, mixed, bagged, labelled and palletised in just ten minutes, with guaranteed three day, and optional next day delivery, anywhere in mainland Britain. “We believe grass will play an increasing role within UK farming, as livestock producers strive to produce more meat and milk from home-grown forage,” says Tim Kerridge, Agricultural Sales Director for DLF Trifolium. Mr Kerridge continues: “This new mixing plant will allow us to cater to the very specific demands of all our customers – but especially in terms of in-season lead times and the ‘just-in-time’ culture that exists within our business sector. “When farmers order grass seed ‘in season’ they need it immediately, and we have to respond accordingly. The new plant will have the speed and capacity to ensure we can deliver the best lead times in our sector, even at the height of the season – when traditionally most suppliers are forced to extend them by up to a week, due to lack of capacity. More than half of the grass seed sown in the UK has been bred by DLF-Trifolium and the company has more varieties on the Recommended Grass and Clover Lists in the UK than any other breeding company. These varieties are marketed under the HF Seeds, Oliver Seeds and ForageMax brands. They are also included in the mixtures of many third party merchant customers who sell them under their own brand identity. All the forage mixtures will be produced in the new plant from next autumn, when the company relocates from its existing site in Leith, which has been operating as a grass seed mixing facility for more than 50 years. The Man Whose Grass Is Always Greener!